Nautical Watch is an appropriate name for this North Myrtle Beach resort because it is on the oceanfront and every North Myrtle Beach vacation rental at this resort has gorgeous oceanfront views. Everyone can watch the Atlantic Ocean during your North Myrtle Beach vacation at Nautical Watch. This North Myrtle Beach resort is located in the Windy Hill section of North Myrtle Beach, South Carolina. It is closely located to shopping, dining and entertainment at Barefoot Landing, while being near the shag-dancing capital, the Ocean Drive section of North Myrtle Beach. From Nautical Watch your family can easily get to the live entertainment theatres, outlet malls, banana boat rides and water slides during your North Myrtle Beach vacation. There is a sparkling blue swimming pool at Nautical Watch. Fully relax on the sun deck surrounding the swimming pool. Get a suntan while reading your favorite book. Write old-fashioned postcards while lounging poolside. Nautical Watch is just three-stories tall so you can be at the swimming pool or the white sandy beaches from your North Myrtle Beach condominium in no time. Choose a two-bedroom, two-bath North Myrtle Beach rental at Nautical Watch for your beach vacation or opt for a one-bedroom, two-bath condo in North Myrtle Beach, South Carolina. These North Myrtle Beach vacation rentals are set up to accommodate four or six people comfortably. They all feature a nicely furnished kitchen, high-speed Internet access and a private oceanfront balcony. You will love your accommodations at this North Myrtle Beach resort. There is plenty of space in the two-bedroom North Myrtle Beach condo rentals at Nautical Watch. The kitchen features a long countertop and bar and it opens to the dining area and living room. The living room in these condos in North Myrtle Beach, South Carolina is comfortably furnished and open to an oceanfront balcony. With the sliding glass doors open slightly everyone in the North Myrtle Beach condominiums can feel the sea breezes gently blowing in off the Atlantic Ocean. 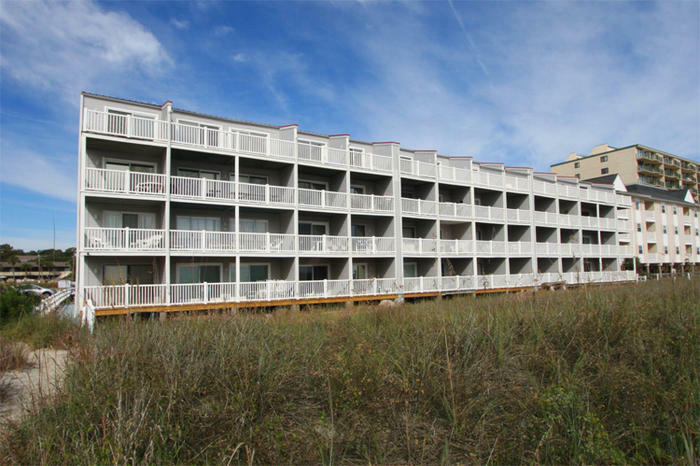 The oceanfront balcony is accessed from the master suite in the two-bedroom North Myrtle Beach condos at Nautical Watch. Wake up early and see the oceanfront sunrise during your North Myrtle Beach vacation. Have breakfast and coffee on your oceanfront balcony and watch the tide ebb and flow as you relax in the North Myrtle Beach sunshine. Elliott Beach Rentals is not affiliated with onsite management or the HOA of Nautical Watch.